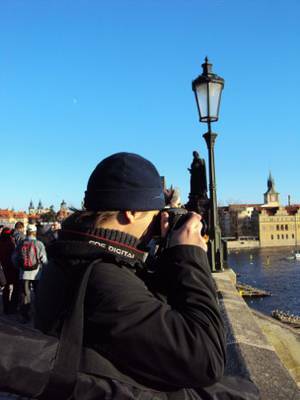 Me on Charles Bridge in Prague taking photographs. What camera and lenses do I currently use? A Canon EOS 1000D. I use the standard (without image stabiliser) zoom lens Canon EF-S 18-55mm 1:3.5-5.6 II, LD Di II Tamron AF 55-200mm 1:4-5.6 Macro and a Tamron AF 70-300mm 4-5.6 Di LD Macro 1:2. A Bilora C283 Perfect Pro Carbon Tripod with a Bilora Perfect-Pro 2258 ball head. What Rucksack do I use? Where do you find my photos? On flickr and on wikimedia commons. Which Licenses apply to my photos? All the stuff underlies the „German Urheberrecht“. But most of my pictures are licensed under a free license. If unsure ask me.